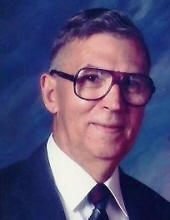 Mr. James E. Kessler of Greensburg, Kentucky, son of the late Roy Kessler and Collie Judd Kessler, was born on Monday, August 30, 1926 in Illinois, and departed this life on Saturday, September 1, 2018 at the Campbellsville Nursing and Rehab Center in Campbellsville, Kentucky. He was 92 years and 2 days of age. He had made a profession of faith in Christ and was a member of the Oak Grove Separate Baptist Church. He was a former Salvage Saw Operator for Greensburg Manufacturing. He was also a Veteran of World War II having served in the United States Army and was a member of the American Legion Rod Lowe Post #124. Survived by his wife of 71 years, Dorothy Arlene Gentry Kessler of Greensburg, Kentucky, having united in marriage on November 9, 1946 in Green County. Other survivors include one daughter and a son-in-law: Marilyn Sue and Gordon Judd of Greensburg, two sons and two daughters-in-law: Junior and Margaret Kessler of Greensburg, Tim and Kim Kessler of Munfordville; five grandchildren: Deanna Scott of Summersville, David Judd of Campbellsville, Veronica Jones and Holly Ferguson both of Greensburg , and Allyson Sweet of Bonnieville; nine great-grandchildren; eight great-great-grandchildren; two sisters: Joyce Pepper and Caroleen Bishop both of Greensburg . Mr. Kessler was also preceded in death by a great grandchild: McKayla Scott. The funeral services for Mr. James E. Kessler will be conducted at 11:00 A.M., Central Time, Monday, September 3, 2018 at the Cowherd and Parrott Funeral Home with burial to follow in the Oak Grove Separate Baptist Cemetery with full military honors by the Glasgow Honor Guard. Bro. Ricky Arnett and Bro. Garnett Davis officiating. The family has asked that expressions of sympathy take the form of donations to the Oak Grove Separate Baptist Church Cemetery Fund, which can be made at the Cowherd and Parrott Funeral Home. To plant a tree in memory of James E. Kessler, please visit our Tribute Store. "Email Address" would like to share the life celebration of James E. Kessler. Click on the "link" to go to share a favorite memory or leave a condolence message for the family.